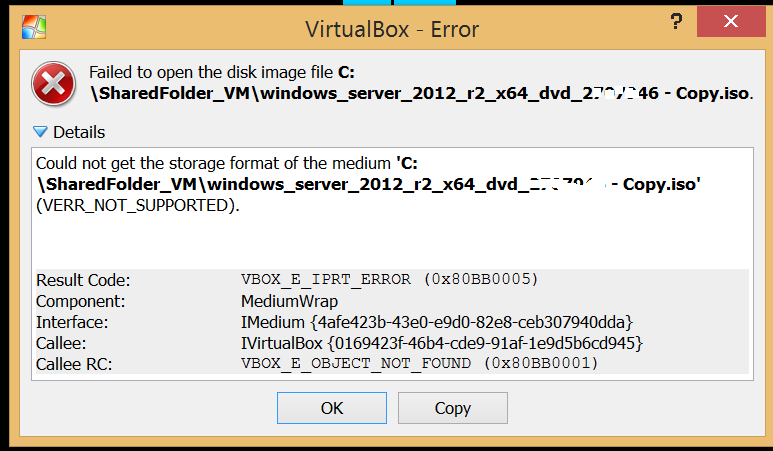 Recently my friend was trying to set up an environment in virtual box with the iso file for Windows Server 2012 R2. He was getting the below error and has asked my help. I would like to share the reason for this issue in our case with you. If you come across a similar error it would be helpful and would save your time digging for more information on the web. Could not get the storage format of the medium ‘C:\SharedFolder_VM\windows_server_2012_r2_x64_dvd_2707946 – Copy.iso’ (VERR_NOT_SUPPORTED). The issue here was mainly with the ISO file (an incomplete one). ISO file size was not as mentioned in the Microsoft site and believe something went wrong while downloading the file and it got messed up.